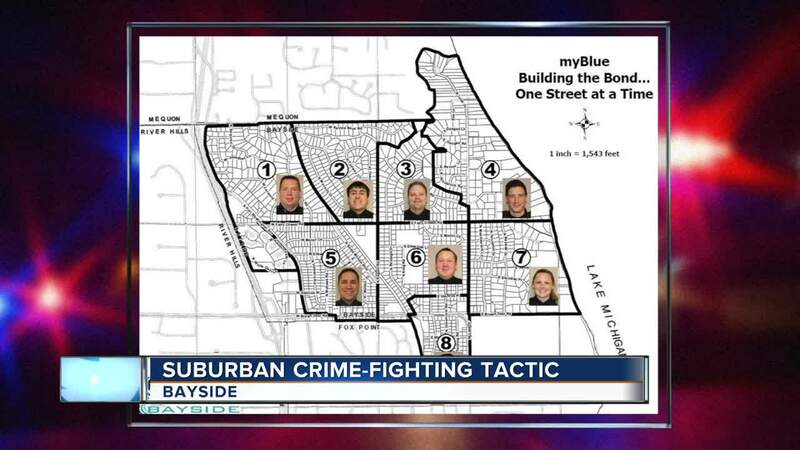 A new suburban crime fighting tactic involves one officer patrolling one sector of Bayside. There are seven officers for seven sectors. The program is lalso hoping to boost community relations. The Village of Bayside hopes a new program, launched this month, will boost relationships between officers and neighbors. Chief Douglas Larsson said 'My Blue' divides the village into eight sectors - each of which is assigned a devoted, sector officer who does foot or bike patrol and builds bridges with neighbors. Larsson said he wants all eight sector officers working to make contact with every household in their respective areas. "I want them to be the Chief in their neighborhoods," Larsson said. "Let them make the decisions, let them have the resources, and let them have the ability to identify problems and solve them." Larsson said he wants the officers building bridges with neighbors so people feel more comfortable coming forward to report problems. He said strong police-community relationships, an idea which dates back to the 1940s, are just as important in a low-crime area like Bayside as they are in larger cities. "The goal is not so much to keep crime low, but to increase the communication processes," Larsson said. "One of the measures of success will be if we are getting more reports." The village plans to regularly survey neighbors to gauge whether 'My Blue' is working going forward.